I would like to shed some light on Canada’s NEW Food Guide. Yes, there is a brand new guide out right now! My aim is to debunk some common misconceptions and myths surrounding this fresh resource. On a whole, this has been an exciting announcement for Canadian health professionals, yet it has also been ruffling some feathers since it was released in late January. This calls for some myth busting and clarification. 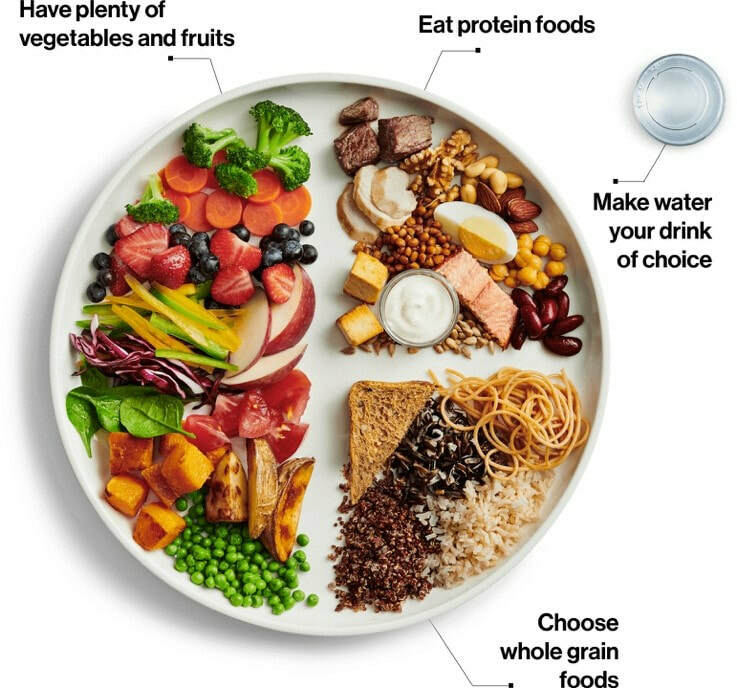 Canada’s Food Guide is an educational material created by health professionals under Health Canada with the intent of defining and promoting healthy eating practices among all Canadians. Now, this updated version looks a lot different visually in comparison to the previous guide used since 1992.. No longer does it reflect a rainbow shape with four distinct food groups in four different colours (Green – Fruits and Vegetables, Yellow – Grains, Blue – Milk & Alternatives, Red – Meats & Alternatives). Resembles a plate which uses real food images sitting on a plate versus drawings. Encourages food choices from three specific areas (Fruits and Vegetables, Proteins, and Whole Grains). Promotes healthy eating habits such as being more mindful, to cooking more meals and eating with others. ​Nutrition is a science. In this intricate and fascinating world, we are always exploring new concepts in food coming from medical/health research findings and learning better ways to convey health-related messages to the public. Here is my New Food Guide Q&A: Hopefully this article helps answer some of your burning questions regarding Canada’s NEW & IMPROVED Food Guide. 1. Water is now being promoted as the top beverage choice. Water is truly the very best drink for your body. There is no sugar, calories, fat, or caffeine found in H20. It is also the most cost-effective hydration method if you carry a reusable water bottle with you; which in turn is a great habit to subconsciously drink more water throughout the day. If you do not enjoy drinking plain water try adding some lemon, lime, cucumber, watermelon, or even frozen berries to your water bottle for a burst of natural flavour. 2. Where did dairy go? On the previous rainbow food guide, milk and milk alternatives (such as cheese, yogurt, and plant-based milks like almond, coconut, soy, cashew, oat etc.) had their very own food group. The ‘blue’ food group. Dairy is no longer its own specific group for a several of reasons. The older version suggested intaking too much per day, plus you can obtain the important nutrients found in dairy products such as calcium from other plant-based sources like soy, leafy greens, and nuts. But these foods are not fully eliminated. They are just now found within the proteins group. There is lots good nutrition found in these foods (calcium, vitamin D, and phosphorus). Health Canada recommends enjoying these foods in moderation for bone health, but from lower fat milk/yogurts and lower sodium cheeses. 3. Plant-based proteins are encouraged over animal sources.Animal proteins are considered a complete protein because they contain all 9 essential amino acids; whereas, plant proteins (except for soy) are incomplete in their amino acid make-up. However, a diet too high in animal proteins runs the risk of developing heart disease, constipation, and a lowered immune system. The new food guide suggests obtaining most of your protein intake from plant-based proteins. CFG recommends eating approximately one-quarter the plate of protein per meal. When you combine various types throughout the day you will cover all your amino acid requirements. Some delicious examples are chickpeas, black beans, quinoa, oats, nut butters, chia/hemp/flax seeds etc. A suggestion would be making weekday lunches more plant focused, or designating a couple nights per week to a meatless dinner. 4. Emphasis on eating more fruits and vegetables. It is ideal to fill half of your plate with a variety of fruits and vegetables (more vegetables than fruits) on a daily basis. All different colours; at least one dark green and one orange vegetable and/or fruit serving daily would be fantastic. “In Canada, vegetable and fruit intakes are consistently low”2 Both fruits and vegetables are jam-packed with vitamins, minerals, fiber, phytochemicals, and many other vital nutrients for optimal health. By eating more produce, chronic disease risks are essentially lowered, digestion is operating more efficiently, plus they even support good eye health. Main meals of breakfast, lunch, and dinner are a fantastic time to focus on getting enough. Popular, flavorful favourite whole fruits like bananas and apples, as well as carrot sticks act as quick and easy snacking options too. “We receive a constant stream of changing (and often conflicting) messages on healthy eating. Food marketing is evolving rapidly, and now includes channels such as social media. This complex and crowded information environment can make it hard for Canadians to make healthy eating choices.”2 Beware of tricky food marketing advertisements and campaigns out there. Ask yourself what are they try to sell me? What positive nutritional benefits am I receiving from eating/drinking this product? Take a quick glance at the ingredient lists and nutrition fact tables found on packages to help make better informed decisions. 6. Where are the healthy fats?Healthy fats are still found within CFG and are integrated into various foods. Our bodies need fat for several bodily functions such as providing an energy source and protecting organs, as well as supporting healthy hair, skin, and nails. The type of fat we want to be eating daily is unsaturated fat found in foods like olive oil, fish, avocadoes, nuts and seeds. 7. Are portion sizes no longer relevant?The previous CFG contained suggested serving sizes that were quite confusing for most to understand. “Should I be carrying measuring cups around with me?” was a common question I received…which is just ridiculous! Every individual has unique eating preferences and personal nutritional intake needs we need to take into consideration. When using this guide, it is highly important to apply three important principles: variety (different foods. Ex. oranges, apples, berries…), balance (different types of foods. Ex. berries, carrots, beans, whole grain bread…), and moderation (amounts). If you practice these all together simultaneously you will be achieving optimal health benefits via your diet. 8. Is the new CFG more expensive for the average Canadian to follow?Not necessarily…but with the push to eat more vegetables and fruits the question of affordability arises since fresh produce can be much more expensive in some areas. There are no major nutritional differences between fresh and frozen produce; so go for that frozen bag of berries to place less stress on your wallet. As well, canned beans and vegetables are commonly cheaper; get these if you wish, just be sure do drain and rinse with water thoroughly. Lastly, bulk sections of grocery stores can be a huge cost saver. Whole grain pasta, oats, lentils, nuts, seeds etc. are an excellent way to purchase these healthy items. The Canada Food Guide was long overdue for a facelift with current research taken into consideration. Health Canada states that chronic diseases account for approximately one third of direct health care costs. The Canadian population is aging, faces high rates of obesity, and engages in sedentary lifestyle behaviours. Thus the impact of chronic diseases is likely to continue to increase, unless we take action to address the many factors that influence what we eat (2). Introducing a new framework to use in discussing healthy eating is a definite move in a positive direction. Still want to learn more about Canada's Food Guide and how to integrate these changes into your life? At FoodImpact we aim to improve the food environment in schools and workplaces across Alberta through nutrition education. We use the newest version of Canada’s Food Guide as a useful resource to teach healthy eating behaviours. Please note that I state it as a ‘resource’; it is a tool, not a strict rule book. Let's get in touch! References: 1. Health Canada. History of Canada’s food guides – from 1942 to 2007. http://www.canada.ca/foodguide. 2. Health Canada. Canada’s Dietary Guidelines – for Health Professionals and Policy Makers. http://www.canada.ca/foodguide.